"M-Series" dry-type low voltage power capacitor is a newly developed product of YUHCHANG lacquered metal shell makes the capacitor neat and pretty in appearances, as well as having anti-fire and against climate change character. Its vertical rectangular cylinder in shape is convenient for aggregate multiple units to get bigger capacitance. 1. Standard: CNS 1179, 3738, JIS C4901, IEC 831. 4. Maximum working voltage: below 110% of rated voltage. (Below 8 Hrs during 24 Hrs). 5. Maximum working current: below 130% of rated current. 6. Dissipation factor: Less than 0.15%. 8. 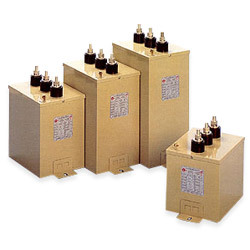 Discharge character: the residual voltage drops down below 50V in 1 minute after the capacitor being disconnected from the power source. 9. Protect character: self-healing mechanism and built-in protective device.